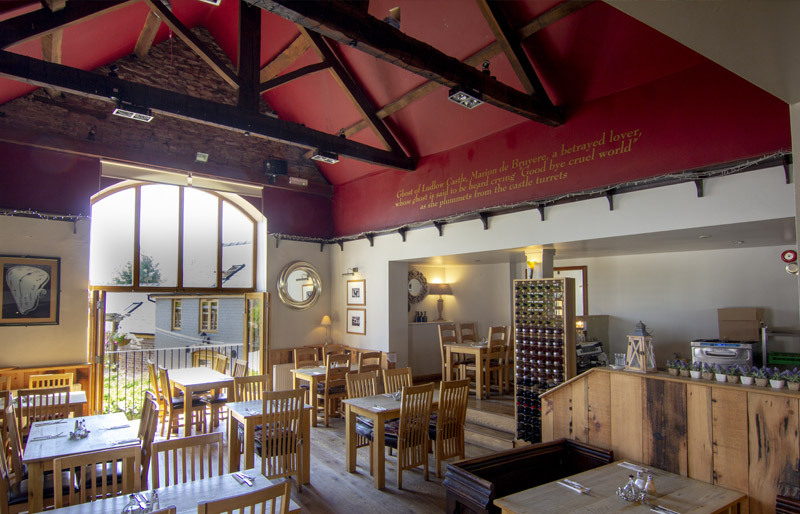 Walk through the bar, down a couple of steps into our impressive, vaulted roof restaurant. This boasts a large arched window with bi-fold doors that open, in the summer, onto our pretty patio area at the rear of the pub, this gives a feeling of eating outdoors. Our menu has a strong emphasis on good, local homemade food. Our seasonal menus change daily, but we do keep our most popular dishes i.e. Piggin Chicken & Beer Battered Cod going throughout the year! Our Sunday Roasts are very popular, with Herefordshire Beef & Shropshire Turkey always available and supplied by our excellent Ludlow butchers. Our chef Dave’s Yorkshire Puddings are so popular we supply them with every main course if requested. We do get very busy in the restaurant, especially at weekends, so we always advise people to book a table to avoid disappointment. Below are some sample menus of food that we serve at The Queens. Please note that all menus, except the Christmas menu, are likely to change daily.